As a few people have already noticed, my name has acquired a snazzy new color. While a part of me will miss wearing a taiga-centric color, I overall am looking forward to what will hopefully be a painless process of integrating to my new role as admin. Now, I actually was taken a little off guard by this myself, so this notification thread is more then a little unpolished. Cliff notes version, the vote had been in the works for a while, but it being completed today, which resulted in my being tapped to replace the vacancy that roadbuster left behind, was not something I had anticipated. That said, me being made administrator will only effect a few areas of BL and most of these are things normal forumites will not be effected by. The changes that most concern you is as an admin I have some extra latitude in my day to day policing of the forum, and my vote will count differently then it did as a moderator. My elevation aside, my no longer acting as a mod leaves a vacancy in our mean green team. This is a problem because both seika and mac have noted that the work maintaining and running the forum was more stressful then they had envisioned, as a result, there is a high likelihood we will look for another active member (actually, some on the team are even pushing for two new members) to join the crew. ...and if that should occur, hopefully I will be a bit better about doing one of these forum notifications. 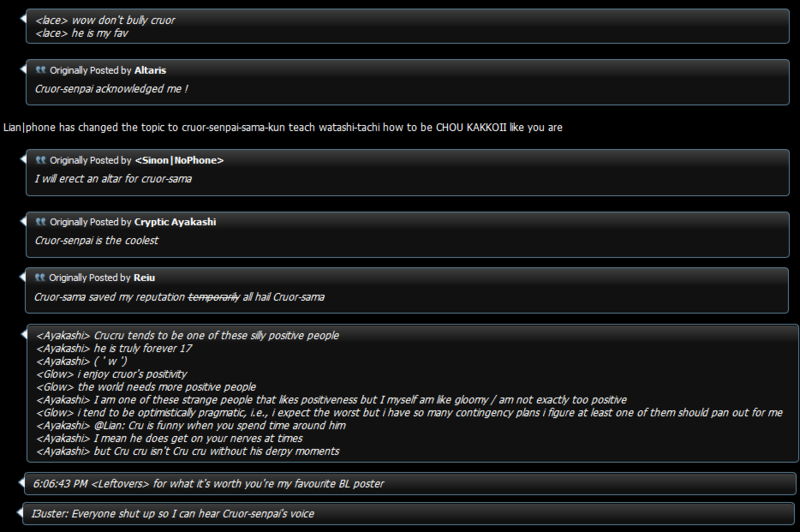 Just please stay away from the forum cogs and gears panel when you've been hitting the brew thanks. Last edited by Kat; May 8th, 2015 at 04:41 PM. Green is a Taiga colour? And didn't realise MacSeika was finding the job tough. More help would be good. Wait a minute, the third magic isn't about time travel? Well, with the Taigabutt, it was only a matter of time. No, my sidekick is getting ever more powerful! So how much xp does a food puppet give? You've clearly gained enough to get a class change. Its called a job advancement. My elevation aside, my no longer acting as a mod leaves a vacancy in our mean green team. I don't understand why you being admin means you're no longer going to do mod stuff. There are votes and choices that are more traditionally handled by the mod team. Now I'm nosy so I will probably still shove my nose in every once in a while, but while y'all probably won't see anything different, the team might. Admin accounts are actually time-locked out of the forum for the majority of every week, it's hardcoded into the vBulletin software. Yeah, there are internal rules within the modding and admins which allowed certain actions. Except after the rule change before the last one (not the last policy change that happened with Seika/Mac), I thought we found out that you guys changed how the system operated and never exactly clarified how it went. Previously the system sounded super democratic (which I don't think is very much needed) and needed like all 4 admins agreeing or more than half the mods or something to issue a warning/ban. But when I talked to DP and I think Irun or someone in the rule change thread they were like that hasn't been done in awhile (as it makes things needlessly difficult). And the rule change itself was done to change from the voting system to one where you have 3 strikes and then banhammer (though, I think there was a slight chance of strike removal). I assume votes are for rule changes or mod additions? Last edited by Cruor; May 8th, 2015 at 06:48 PM. It was always like that, when there's a stalemate it went down the mods. The mod team is there specifically so the admins don't have to do everything. That's kinda the point.